Things About Who, What, When, Where and Why: Reflection. I stumbled across this picture of me. It is not the clearest . I think it was my first communion. 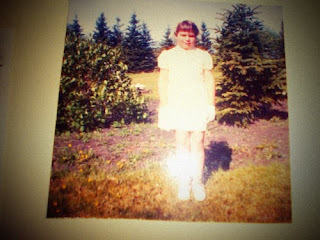 Little white shoes with a little white dress and little white gloves too. I never even did it up that good for my first wedding. I wore sapphire blue, but that is a different story for a different day. It is funny how we remember pieces of a childhood. Looking at this picture reminds me of the old house we lived in, the new one stands on the land behind me now. A different house, a different place, the memories of a schoolbus picking me up for school. It was a much different time and it seems so long ago, but then it feels like yesterday, holding on to the fragments of my youth, sifting them like sand through an hour glass. They are me. Hey Cindy!! Thanks for visiting me! I would love to have you come by a 7.30pm each Friday night for a scrap n' chat!!! Pity we live in different countries girlfriend!!! C u soon!! You're glowing ... and what a lovely backgrop! wowza.